Originally presented at The Getty Center, this series features commissioned pieces supported, in part, by Montalvo Arts Center, with existing short films, media projections, and musical compositions that explore the creation of art through the recomposition of found and new materials. 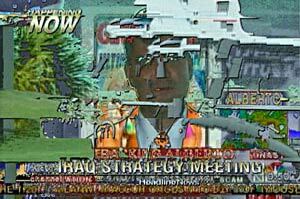 News Cycle #2 is a live collaborative digital artwork consisting of reprocessed and interwoven excerpts from three 24-hour cable news networks. The raw material is 36 hours of news footage, 12 hours each from CNN, MSNBC and Fox news from one day in summer 2006. Each section of the piece represents a different compression of the day’s footage, exposing digital and analog artifacts inherent in the technical processes. The resultant sound from this footage is manipulated using a customized digitizing tablet to "draw" a score by extracting data from the video stream. The tablet is used to select specific scan lines from the piece, generating changing buffers that are subsequently convolved with either the audio content of the video, pink noise (in silent sections) or a mixture of the two. Indie band Califone (Joe Adamik, Jim Becker, and Tim Rutilii, with Fugazi drummer Brendan Canty) perform the soundtrack for the premiere of filmmaker, visual artist, and musician Brent Green's Paulina Hollers (work-in-progress, 15 min.). This is an animated story, written by Green, of a grieving mother created with stop-motion rabbit bones, hand-carved wooden angels, and a hand-drawn hell.